Two weeks ago Rose Orset (picture), organic farmer cast as fringe-celebrity for starring in a long-running mis-en-scène orchestrated by the British pasha of film Ridley Scott, her neighbor in Oppède mind you, set up her stand at this season’s first Sunday farmers market in Coustellet, having endured six-years of legal complaints from M. Scott that threatened the livelihood of her family — an ordeal that had them “living a hell,“ said her husband Christophe, sort of like being waterboarded by aoli — now at last offering her home-produced eggs and veggies without worry, the administrative and judicial decisions all having fallen in her favor. Setting: Oppède is a commune of farms and vineyards located in the western Luberon south of D900 bordering Menerbes, not a place anyone passes through, rather accessed via Coustellet, a swath of commercial enterprises bunched up at an intersection (D900 and D2), resembling more a typical American roadside town than a Provencal village. Script: As any film buffs will note, this script is character-driven, obsessional variety, and the dilemma is whether the Orsets can maintain their “métier” for their family of three spawns. Storyboard: Image 1: In 2004, Rose and Christophe Orset, residing in Oppède, purchase a two-acre plot of land for Rose to exploit for organic farming and to augment Christophe’s income as a design instructor. They construct greenhouses on the property. Image 2: The Orsets open a letter from Ridley Scott, who had purchased in the 1990’s a large property, a former military hospital and vineyard, bordering the Orset’s, in which he professed his love of the Luberon and accused them of disfiguring the landscape by putting up greenhouses. As Christophe remarked at a later date, M. Scott never spoke to the couple directly, rather he chose to speak via emissaries, the first being (Image 3) the American actress Julie Payne, accompanied by a interpreter, who told them that the trees planted were not growing fast enough to shield the greenhouses and proposed to finance a hedge of 12 feet. Rose objected, saying that at such a height the hedges would block out too much sunlight, and that the structures were not visible from Scott’s property. Then a sum was thrown up as a price for the property if they would move elsewhere. Rose and Christophe reacted with indignation. The battle had been joined. Images 4-8: M. Scott launched a series of administrative and legal actions – a total of five in six years – protesting ditch / firebreak, a shed for stocking materials, a chicken barn, and the final legal thrust about the odor and noise pollution of the chickens, the court’s final ruling in Dec 2009 stated that the Orsets’ structures as well as the chickens conformed to code, at which time an appeal could have been filed in six months (June 2010). Note to the reader: This storyboard is laid out here in stark images; the French and British media have gleefully documented the unfolding drama through the years. Now, time to wipe off the goggles and take a fresh look at the script: the import of the saga to those who reside in the region, an aspect that breathless reporters had no time for as most filed their stories from afar. – In the Luberon, there are 400 to 500 expansive luxurious properties owned by the upper tier in a quest for lifestyle self-determination, and some among this tribe have a lingering sense of entitlement that extends beyond their properties. – From the outset this script attracted the class-contempt of locals who conceived it as an attempt of an upper tier, employing his economic privilege, to prevent a lower tier from earning income from the land, farming being the predominate tradition in the Vaucluse. 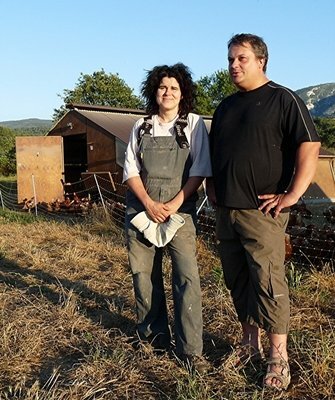 – There was high irony in that the guardians of the landscape in the Luberon are the farmers – think of the recent protests against the golf course proposed by Pierre Cardin in Bonnieux — yet in this script it is an upper tier landowner taking farmers to court for farming. – As David Foster Wallace so brilliantly noted: “Movies are an authoritarian medium. They vulnerabilize you and then dominate you.” Alas, the Orsets when handed a script from a celebrity metteur en scène, refused to play the roles. – A latent xenophobic gene reasserted itself among some natives, certain only put up with foreigners “à petites doses,” and a repressed resentment against absentee landlords (M. Scott spends little time in the Luberon by his own admission) and Brits, who until their pound sterling crashed vs. the euro took in the Luberon with an amusement park-like gaiety. One might wonder if this six-year bust up rubbed off on the reputation of the Brits who make the Luberon their paradisal home either year-round or during the summer season. Curiously, the Brits have an innocuous presence in the region, blending into the landscape and they are only recognizable when they flock to markets or select cafés. Brits in the Luberon at times are identified by the sobriquet, “Les Maylistes,” a term denoting those that seek to fructify the fantasies of Provencal life and its secret pleasures as embodied in the writings of fellow Brit Peter Mayle: the sensation to share in universally — beyond the vicarious — his heightened experiences. Nowadays, getting a fixer-upper as Mayle did is beyond the budget of only the top tier. As Brits are coupled with native English speakers, the lack of fluency in French language keeps them from mixing in with the locals, and one finds that in the household the female is more at ease with French as she handles quotidian tasks such as shopping and dealing with the handyman. 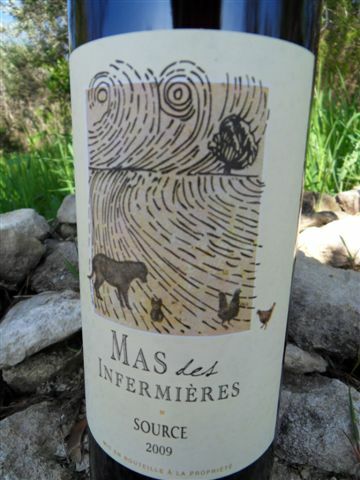 The Luberon Brits are very keen on French cuisine and wine, French culture less so as it is not accessible without fluency. Many arrange for regular deliveries of British goods, namely Marmite. 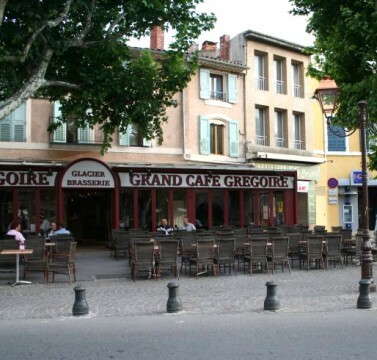 In Lourmarin, they mingle at the Café de l’Ormeau and the Café Gaby, a Mayle hang out, in the center of town. 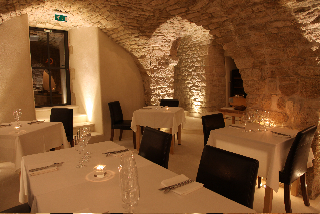 Le Fournil in Bonnieux and La Petite Cave in Saignon (photo l.) with its English chef are two restaurants they favor. For wine, they relish a Mayle tipple: Château Constantin-Chevalier. For those only in for a fortnight or less, there is the posh Les Olivettes, a Bastide with well-appointed apartments run by an English-American couple in Lourmarin. Without fail they listen to the BBC. You will notice that they have a reluctance to buy a French car and continue to drive a right hand drive with English registration plates. Some even insist on changing French electric plugs for English ones in their homes. Then there is the Brits’ insistence on English lawns that consume large amounts of water which the French consider shameful. The epitome is the English landscape architect Alex Dingwall-Main, author of “The Luberon Garden” whose home in Lacoste (now sold) has a lawn as big of all Wimbledon Tennis. In fact, there is a zig-zag of lavender which forms a “W” known locally as “The Ding-Wall” or “Wimbledon,” even pointed out by Ryanair pilots as planes climb out of Marseille. This particular British fauna in the Luberon is on view during meetings of ex-pats at the Café Gregoire in Apt every Saturday at noon at the Place de la Bouquerie — also the site of the Grand Marché Provençal from 8:00 a.m. to 1:00 p.m.
Now whereas you may think the Brits are ill-adept at the Provencal way of living and that they need to recreate Blighty, they are quite content living as they do in the Provence sunshine. This entry was posted in Reportage and tagged Oppede, Peter Mayle, Pierre Cardin, Ridley Scott. Bookmark the permalink.